I got sick this week. :( Really sick. Flu sick. And, that didn't really make me want to cook meals. All I had a taste for was toast with jelly. But, I'm feeling better now. The only thing worse than getting sick in the hot, humid summer is getting sick after you've purchased a ton of veggies from the market and they sit in the fridge, slowly going bad, until you feel well enough again to devour them. So, even though I still feel a little under the weather, I decided to cook veggies today, because I just hated the thought of all the veggies in my fridge going bad. 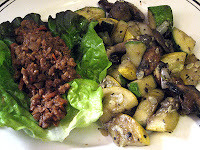 Along with the veggies, I decided to cook the Yves brand Meatless Ground Lettuce Wraps Stuffers I bought during my last grocery trip. Unfortunately, I was not impressed with the Yves concoction. It had a bit of an Asian seasoning to it, but other than that, it was nothing special. I think you'd be better off buying your favorite 'ground beef' substitute and using your own spices to make a filling for lettuce, burritos, whatever. Maybe in a different recipe this meat substitute might be better, but I didn't care for it in a lettuce wrap. My veggies were yummy though. I had some leftover seasoning from a 'meat rub' I made for my Daddy-O for his birthday recently. I found the blend here. The spices made a good seasoning for the veggies! ETA: For whatever reason, Blogger isn't allowing me to add a title to my post. *grumpy* If they get this working, I'll fix it. Thank you for your comment on my blog. I am having a lot of fun with it really. I am also having fun reading all the recipe and food blogs around here. Very cool.